The Lyceum is fortunate to be able to offer these affordable prices through the financial assistance of the Abby Tuttle Fund and the Walter Clancy Fund. We are also grateful for the annual generosity of our Sponsors (see list). 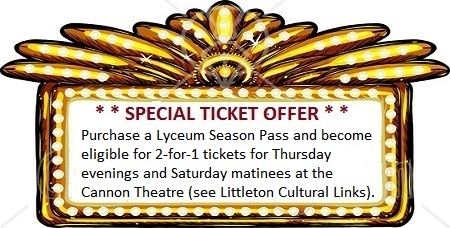 If you purchase a Lyceum season pass you are now eligible for two-for-one tickets on Thursday night performances and Saturday matinee performances at the Cannon Theatre. 1. Contact any of the Lyceum Committee members. 2. Purchase tickets at the door on the night of the program. 3. Purchase tickets now ONLINE safely and securely. A small surcharge is applied to the cost of online tickets to cover the cost of the ticketing service.